We just returned from the ISC West Conference, one of the leading get-togethers of the security industry. As at all major shows, we set up one-on-one meetings with the leading editors - in this case, 16 of them - with our clients (5 at ISC). Prior to the show, we review what features are upcoming in their publications and steer conversations with our clients towards those features. And, with that background plus special, individualized kits for each editor, we were able walk out with over 50 stories planted for the next six months. 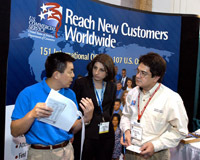 Speaking of Trade Shows - Do You Market Yours? * Promote your audience ahead of time - Give people reasons to come to your booth. Shows often offer mailing lists of past attendees at a reasonable cost. * Train your booth staff to help people. They aren't just there to give away pens. Be sure the staff is informed on the key benefits of your product/service. * Actively greet people who are walking by to engage them. If a passerby isn't a direct prospect, they may know someone who is. * Use good booth signs that say what you do and include your name. * Follow-up after the show. Seems simple, doesn't it? But, we were just at a show and we can guarantee you that 80% minimum did none of the above. Their booth traffic showed it! We hope you have found this newsletter to be informative. If there are others you know that would like to receive this email, please feel free to forward us that information or call us at (818) 716-9021.